The importance of water when it comes to the taste of your tea is a subject that has been discussed often on this tea blog and on others. Steeping techniques have been examined in the minutest detail all over the blogosphere and social media sites. So, what else is there to say? Plenty! While people are fussing about water quality (hard water versus soft water, distilled and filtered versus municipal system water coming out of the tap), they tend to forget about temperature. Some teas steep very quickly – even for only a few seconds – and others need more time – as long as 10 minutes. It’s those long-timers that are the issue here. Anything that has to steep for 3 minutes or longer will experience some cooling, even if the steeping vessel is covered. Several things affect how fast water temperature will decrease during steeping: room temperature, what the steeping vessel is made of, its shape, whether it has a lid, if a fan is on nearby (especially if it’s blowing towards the steeping vessel), and if you cover it with a cozy or tea towel. All pretty obvious. There is some debate among tea professionals about whether the temperature decreases enough to adversely affect the steeping. 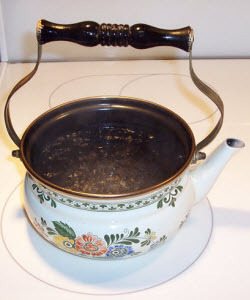 A particular cozy design, for example, was under assault a few years back from these “experts” who claimed the cozy kept the teapot too hot, that a little cooling was needed to avoid oversteeping the tea (no scientific evidence was ever presented to support this). This concern seemed strange considering that for most folks, the big concern is usually about the water cooling too fast so that the tea did not fully steep. That’s touted as a main benefit of the Brown Betty teapot – it keeps the water warmer longer even without a cozy or tea towel over it. One thing is for sure: you can think about things like this way too much and end up spending too little time actually enjoying the tea.